July 13 through August 8th will be the 2015 Illiana Shop Hop. With 10 participating stores (see map), prizes and fun is what it is all about. Celebrating Military Service is the theme with each store sponsoring a patriotic star block and then finishing them in their own style. Suzanne has added inspirational words to her quilt. You can see all the designed quilts on the shop hop website. 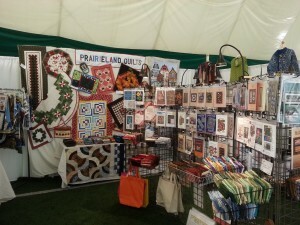 Prairieland Quilts will again participate in the Row by Row Experience this summer. Travel and collect rows from June 21 – Sept. 8, 2015 all over the United States. This years theme is all about water with the ‘Row by Row, H2O’ We will also have the licence plates available while supplies last. Hope to see you this summer! For over 20 years, Suzanne Bruns and her staff at Prairieland Quilts have been sewing samples of different patterns they sell in the shop. Varying in size, shape and color, these samples have hung on the walls, from the ceiling and have been part of displays in the store. Now, many of the patterns are no longer available for sale so it’s time to move them along. “We have almost 100 samples priced from $5 to $875 that we can’t use any more” said Suzanne. 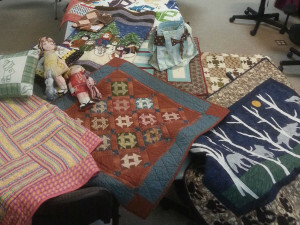 “Purses, wall hangings, table runners and even a couple full size quilts” she added. The Sample sale will be held the weekend of December 5th & 6th and Monday December 8th, just in time for Christmas. Store hours are 9am to 4pm weekdays and 9am to 3pm Saturday. 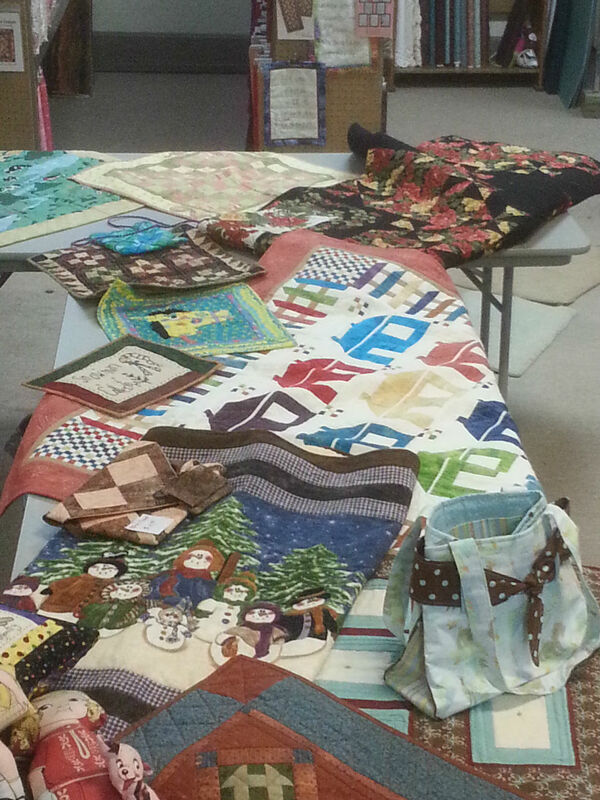 Items to be sold include Christmas wall hangings, Table runners, purses & bags. One wall hanging features Wolves running through the woods; another elegant full size quilt has many individual embroideries placed throughout the quilt. Seasonal pieces, funny pieces and many practical runners and trivets are part of this huge collection of hand made treasures to be sold. 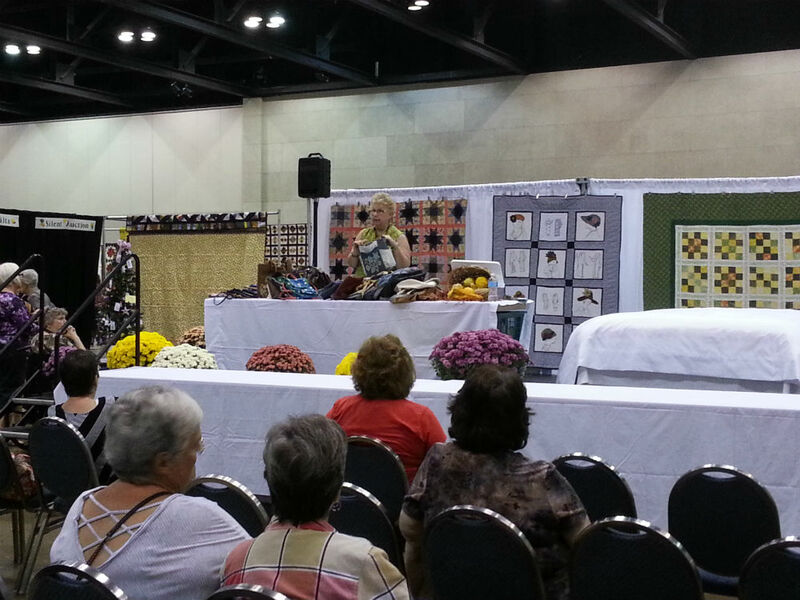 Suzanne Bruns presents “Bags, Purses & Totes, Oh My!” at the Peoria Gems of the Prairie Quilt Show. 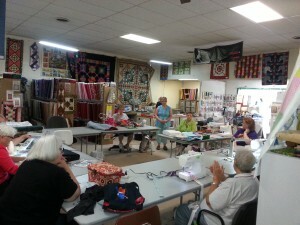 Showing over 35 different bags & purses, Suzanne gave the audience her tips and techniques for sewing & quilting these useful items. 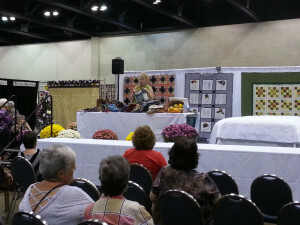 Gems of the Prairie quilt guild show was held in the Peoria Civic Center where Prairieland Quilts also had a vendor booth selling fabrics, patterns, puzzles and quilt block panels. 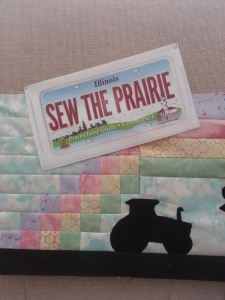 ‘Let the Wind Blow’ is Prairieland Quilts block for the Row by Row Experience Shop hop. Designed by Suzanne Bruns, this block uses the Creative Grids Kaleidoscope & Dresden Plate Ruler to create the Pin Wheels. 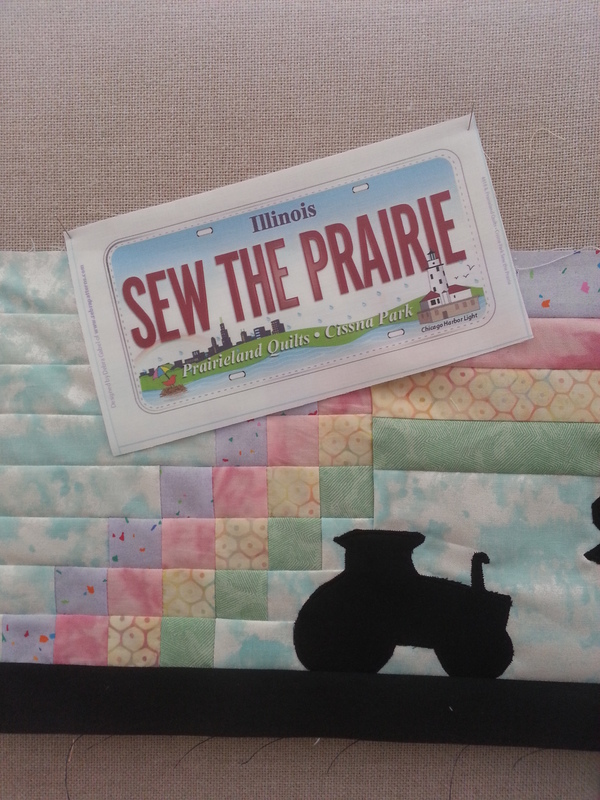 Participants in the Row by Row Experience Shop Hop and stop by Prairieland Quilts will receive this Free Pattern and a kit will be available. Additionally, we will be offering all Row by Row Experience ‘hoppers’ 15% off on their first visit of non-sale fabric while on their adventure. A new kind of Shop Hop, the Row by Row Experience has no fees, no passports and all summer to play. 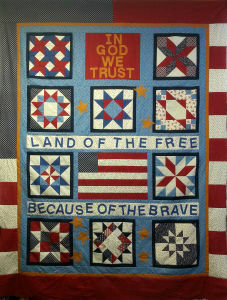 Simply visit any of the participating shops throughout the United States and receive a free pattern for a row in a quilt. Combine your rows in any way to create a unique quilt that represents the fun you had traveling throughout the summer. Travel with friends, discover new quilt shops and have fun collecting rows! complete your quilt for a change to win at any of the participating shops. See the Row by Row Experience web site for details. Prairieland Quilts is exhibiting at the 2013 Gems of the Prairie Quilt show in Pekin Illinois this weekend. 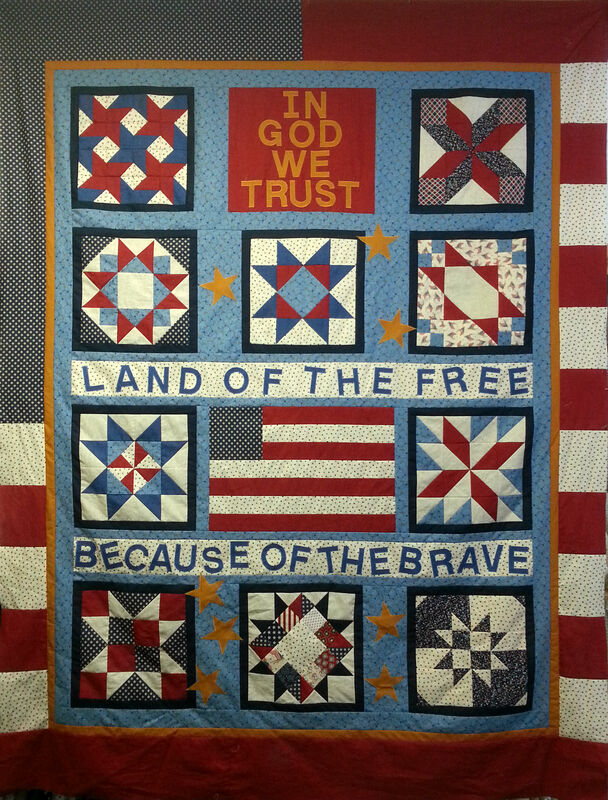 With 20 other vendors and hundreds of quilts on display, this show is one to visit if your ever in the Peoria area when it’s held.